A longtime favorite of Grace Kelly, Brigitte Bardot, and Mick Jagger, and many other celebrities and posh jet-setters, Saint-Tropez, has become synonymous with Cote d’azur style, glamour, and exclusivity. As one of the world’s most coveted destinations, its picturesque coastline and idyllic French Riviera seaside charm continue to attract the international beau monde, and for good reason. Here, situated in the heart of this vibrant hotspot, amidst the moored yachts at Vieux Port and the charming cobblestone streets, the Hotel Byblos Saint-Tropez has been the preferred address since it opened its doors in 1967 and continues to attract globe-trotters and fashionistas alike, especially during the peak summer season. Having recently celebrated its 50th anniversary, this iconic hotel also has a glittering history to go along with its splendid interior and design. Founded on love by billionaire Lebanese hotelier, Jean-Prosper Gay-Para, his adoration and hope to woo the legendary Brigitte Bardot inspired the creation of a befitting hotel and nightclub in the place she had come to love. Months later, the Byblos was taken over by a French businessman who expanded and beautified the property to resemble a fairy tale–like fusion of a Provençal hamlet and the port of Byblos, one of the oldest villages in Lebanon. His vision was certainly achieved and evidenced by the hotel’s “village within a village” feel. Colorful stucco houses with azure-shuttered windows and French doors, verdant gardens, balconies and terraces that overlook the palm tree–dotted courtyard and its central pool, create a space which feels like another world. Today, 91 individually decorated rooms and suites are scattered throughout the extensive property and are all uniquely designed and adorned with plush furnishings saturated in color offering breathtaking vistas of the Riviera. Artisan mosaics, impressive sculptures from the Mediterranean region dating back to ancient Rome, and artwork unearthed in Lebanon fill the public spaces and perpetuate the cultural tradition of Saint-Tropez as a haven for artists. Spend the day lazing by the pool while enjoying the Byblos’ all-day, late-into-the-night restaurant and bar, Le B. which features dishes made from fresh, locally-sourced ingredients and a full range of cocktails. 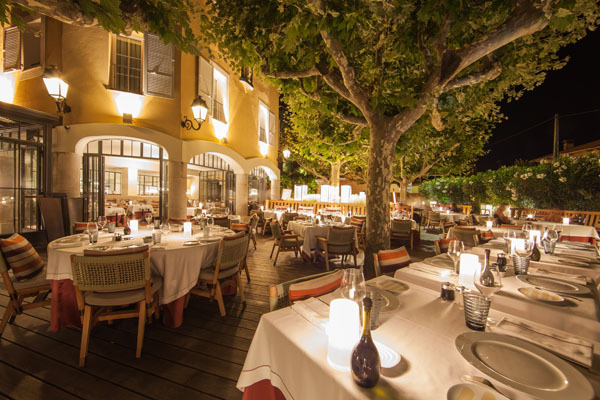 For a more diverse and gourmet menu, the swanky Alain Ducasse concept restaurant, Rivea offers a chic indoor-outdoor space arranged on a massive terrace lined with bold striped loungers under a candlelit canopy of lanterns. Inside, a glass-fronted kitchen invites guests to marvel at the pristine space where Chef Vincent Maillard serves up a creative menu that blends French and Italian influences with fresh, local, seasonal ingredients. Rivea offers a selection of appetizers to share, like spiny artichokes and smoked eel, homemade pastas, and Rivea’s signature dish, marinated sea bream and eggplant. A perfect spot to people-watch while enjoying the exquisite bold flavors, Rivea will leave your palate satiated while the ambiance will prepare you for the evening ahead. Afterwards, just a few steps away, the region’s most famous nightclub, Les Caves du Roy awaits a decadent night of partying and debauchery. Here at this intimate mythical club, the scene rages on until dawn so be prepared to experience top-notch DJs, flowing champagne, as well as some of the best dressed and beautiful starlets and VIPs. 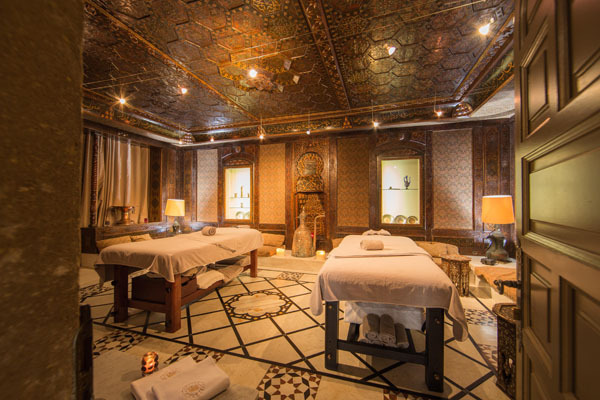 Legendary and magical, the Byblos is a timeless hotel that remains a family-owned business and prides itself on attention to detail and unparalleled service. 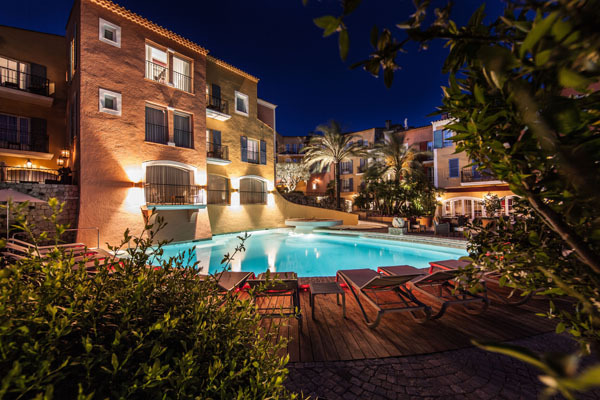 It’s a heavenly retreat from which you can relax, and be pampered, or party in ultimate style and take in all the excitement Saint-Tropez has to offer.